Availability: Registration for the examination will start from the 4th March 2019. The last date to apply will be 4th April 2019. Late fee: You can apply after the last date too but a late fee will be added to the application fee. You can apply online TS EAMCET 2019 but it is necessary to take a print out of the application form and submit to the invigilator at the time of examination. Frozen field: Stream field options available are: (Frozen) + Engineering (E) + Agriculture & Medical (AM) + Both (Engineering and Agriculture & Medical) (E & AM). Stream: You should make sure that you select the correct Stream before applying of TS EAMCET 2019, as this item gets FROZEN as per the information given during Registration Fee payment. Both Med & Engg: The TS EAMCET 2019 candidates belonging to Intermediate board or any equivalent Qualifying Examination who wish to apply for “BOTH” option, should make sure that they are eligible (as per the guidelines are given in the TS EAMCET 2019 Instruction Booklet) for Engineering and Agriculture & Medical before selecting “Both” option. Qualifying Examination: If the examination is Intermediate (Regular), then the button Intermediate (Regular), Qualifying Examination Hall Ticket No. (Latest) and Year of Appearing/Passing Qualifying Exam will get FROZEN as per the information given before, hence, verify whether your Qualifying Examination, Hall Ticket No. and Year of Appearing/Passing are the same. Intermediate Qualifying Exam: If the Qualifying Examination is Intermediate (Vocational), the Item is already FROZEN. Don’t forget to enter the Vocational Bridge Course Hall Ticket number in the Box provided (as shown below) as it is Mandatory. Other Qualifying Exam: If the Qualifying Examination is RGUKT, CBSE, ISC, DIPLOMA, NIOS, TSOSS/APOSS or Others the relevant option should be selected and the following items have to be filled like Medium of Instruction in Qualifying Exam and Medium of Language to take TS EAMCET-2019 Exam. Medium of Instruction in Qualifying Exam: Select the medium of instruction at your Qualifying Exam level, i.e., at your Intermediate or Equivalent (10+2) course. Medium of Language to take TS EAMCET-2019 Exam: Select the medium of language to take the EAMCET-2017 Exam. The EAMCET-2017 paper is printed in English and Telugu languages. Hence, choose anyone. 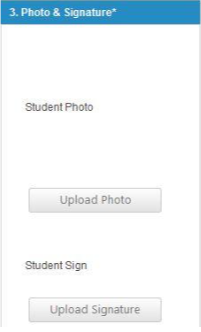 Uploads: The TS ICET 2019 candidates have to upload your Photograph & Signature if their passport year is less than 2003. Photograph: The candidates of TS EAMCET 2019 belonging to Intermediate (Regular) - (other than 2013, 2014, 2015, 2016, 2017 & 2018 appeared I passed) or RGUKT, CBSE, ISC, DIPLOMA, NIOS, TSOSS/ APOSS or Others have to click button "Select file" to upload the photograph file. The photograph file should be in the jpg file format and the size should be less than 30 KB. Signature: To upload the Signature Press the button "Select file" and ensure that the Signature's file format should be jpg format and the size has to be less than 15 KB. 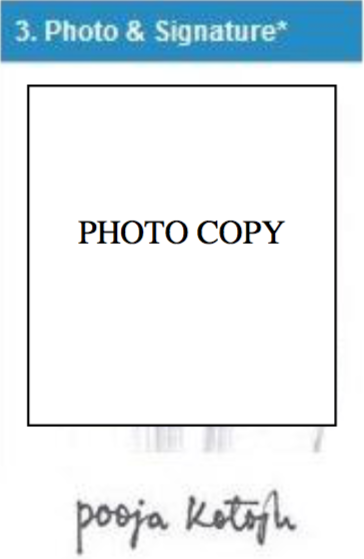 Example: Photo and Signature can be uploaded by clicking on the encircled buttons of "Select file" as shown below. Later, browse for the Photo and Signature files available on the computer system of prescribed file sizes respectively. Mother’s Name: The candidate has to enter his / her Mother’s name in the provided space if the candidate belongs to other than Intermediate board only. Date of Birth: The candidate is supposed to choose the Date of Birth from the drop down boxes provided as shown below. Reference: Refer the figure above, for example, the Date of Birth 02-04-1994, 02 for Day, Apr for Month and 1994 for Year has to be chosen. 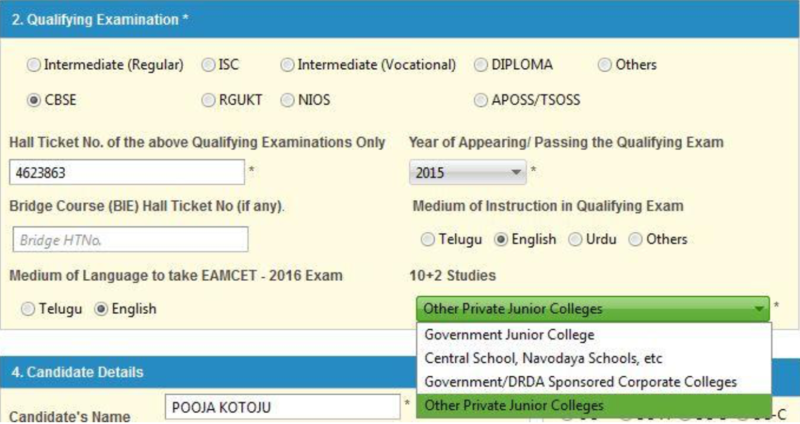 Birth State: In the Birth State, the TS EAMCET 2019 has to choose from the drop down boxes provided. 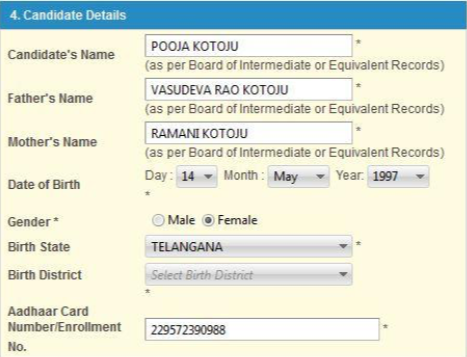 Birth District: Similarly, the TS EAMCET 2019 candidate has to select the Birth District from the drop down with district names of Telangana / Andhra Pradesh only if the chosen Birth State in the previous item is Telangana / Andhra Pradesh. 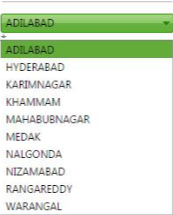 Other states: In case, the Birth State is other than Telangana / Andhra Pradesh, then this item is disabled/frozen and will display as other states. Aadhaar Card Number/Enrollment No: This is an optional item. The candidate is supposed to enter the Aadhaar Card number or the Enrollment number if available, in the boxes provided as shown below. For example, if the Aadhaar Card Number is 499999999999, the same has to be entered. Select the correct Date of Birth (as per your Board of Intermediate Education or equivalent records) from drop down boxes Date, Month and Year respectively. For example, Candidate’s Name is RAVEENDRA REDDY CHITAPANA Father’s Name is VENKATARAMANA REDDY CHITAPANA, Mother’s Name is PADMAVATHI DEVI CHITAPANA Date of Birth is 02-04-1997, Gender is Male, Birth State is ANDHRA PRADESH, Birth District is EAST GODAVARI and Aadhaar Card Number/Enrollment No. is 11111111111. Caste: Select the relevant option corresponding to the Category candidate belongs to as per the Caste certificate. For example, if you belong to OC (Open Category), select the option as shown in the image. Special Category: If the candidate belongs to the Special Category as mentioned in the categories given below, the corresponding option has to be selected by the candidate. Example: If you belong to the special category, NCC. Regional Centre: The candidate has to choose Regional Centre for Appearing Test from the drop-down box provided. Community: The Non-Minority has to be selected if the candidate belongs to the Minority community. 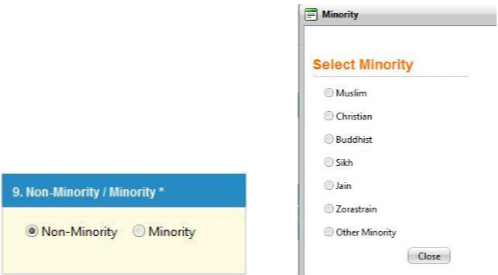 Majority: Otherwise, if he/she belongs to a Minority community, then the Minority option has to be selected by using the drop-down box. 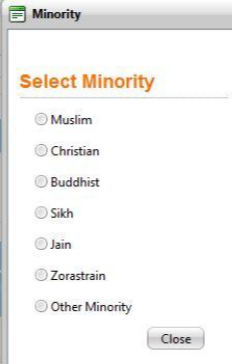 Select sub-category: From the drop-down box, relevant Minority community to which the candidate belongs to has to be selected. Annual Income: Select any one of the three options provided as given below regarding the “Annual Income of the Parents (Rs.):”. URDU candidates: A TS EAMCET 2019 candidate, who has chosen the Medium of Instruction at Qualifying Exam as “URDU”, he/she can avail the facility of a URDU TRANSLATOR if required during the exam by selecting the “YES” option. 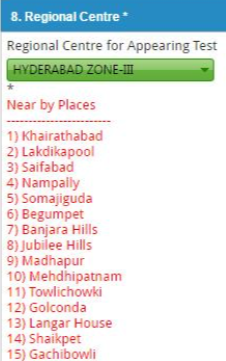 But note that, the candidate will be allotted a TEST CENTRE in “HYDERABAD ZONE” ONLY. Frozen: Hence, this item is FROZEN for NON-URDU candidates. Urban/Rural: Two options Urban or Rural are given for both a1.SSC or Equivalent (10th Class) and b. Intermediate or Equivalent (10+2) class. 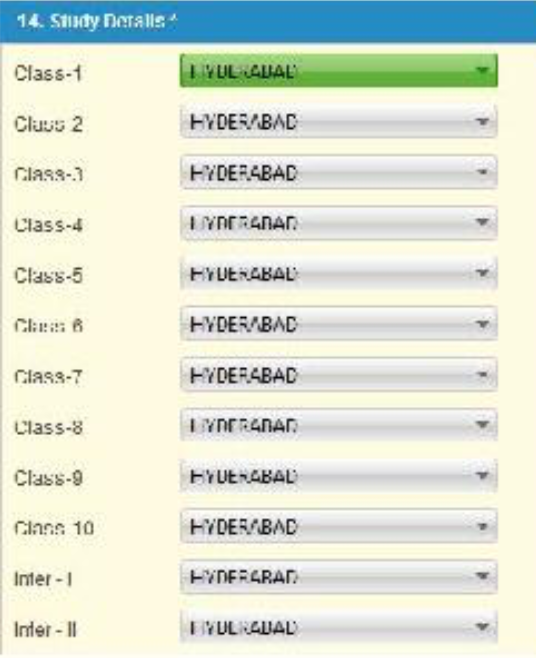 Select the option as per your Place of Study. Hall ticket no: Enter the SSC or Equivalent Hall Ticket No. and Year of Passing. House Address: Provide the House No. or C/o., Village / Street / Locality, Mandal / Town / City, District, State, Pin Code, Contact Telephone Number (Mobile), Telephone Number (Landline) and Email. 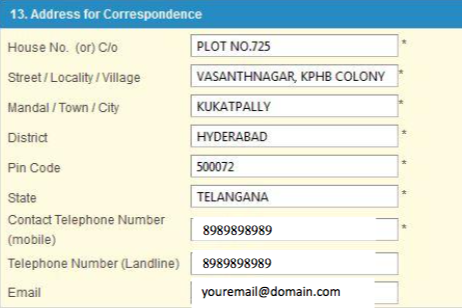 Example: Plot No:18 Village / Street / Locality Kotaya reddy st Mandal / Town / City Kakinada, District is East Godavari, State is Andhra Pradesh, Pin Code: 533003, Contact Telephone Number (Mobile): 9999999999, Telephone Number (Landline): 08842222222 and Email is ravi@xyzmaill.com, refer the image shown. Study place: The candidate has to fill the district details related to his study from Class-1 to Intermediate II year/equivalent in the spaces provided as shown below. However, if a candidate has studied in a state other than Andhra Pradesh, then select OTHER STATE. Terms and conditions: After furnishing all the required data and correct particulars, verify thoroughly the details and go through the Declaration at the end of the page. Select the encircled checkbox against – “I accept the Terms & Conditions” if you are done with Online Application Form filling. Then, press the encircled Submit button to proceed to the next page as shown. Popup: In case you have not completed the application form, a message box will appear as shown below, which indicates that the candidate has not selected / not Entered the required mandatory details as prescribed. Completion: Further, the same will be displayed at the bottom of the page. If all the details are furnished, then the screen will change to the next page after the Submit button is clicked.